Italian-American star Fabiano Caruana moved into lead in the FIDE Grand Prix in Khanty-Mansiysk by scoring a second consecutive victory. Today he won with black against Maxime Vachier-Lagrave. Serious home preparation of those players who had Black today resulted in three rather quick draws. In other three encounters White had initiative after the opening, and even gained a significant advantage in one of them. However, Tomashevsky and Svidler missed their chances. The first nine moves repeated the recent Jobava-Jakovenko played in May in Sochi. That was a dramatic game for the Georgian grandmaster: having an extra pawn, he blundered a whole rook and had to resign. Yet, since White had an advantage in the opening, Baadur had nothing against repeating it again. However, Alexander demonstrated an unexpected and very spectacular innovation: he sacrificed a pawn, then a bishop, and then a rook, creating a swift kingside attack. Activity of his pieces was sufficient only to force a draw by perpetual, but in any case such a short draw as Black can be considered a good result for the Russian grandmaster. His mood also improved after his favorite football club CSKA Moscow celebrated a nice win against their rivals. In this game White also ran into a powerful novelty that seems to change the evaluation of the entire opening variation, and quite a popular one. In Tsaghkadzor (Armenia) Gelfand tested this line against Peter Leko and won the opening duel. The young Dutchman improved Black’s play – he found clever tactics, which forced the game into an ending where Black had excellent compensation for White’s extra pawn. At the press-conference Gelfand admitted that Giri’s analysis was deeper than his; not many people can boast about outpreparing Gelfand! When the lengthy forced line was over, White’s rook was stuck in the enemy camp, and his knight could not reach the ideal central outposts. Seeing that retreating the knight to the rim is clearly bad, Gelfand decided to return the material and defend a slightly inferior ending. Black had slight initiative, but White defended very accurately, and a draw was agreed on the control move. It is well known that Hikaru Nakamura has a very broad opening repertoire, so Leinier Dominguez could take it easy with the homework: guessing Nakamura’s choice is rarely possible. This time the American went for the Sicilian with 4…e5, which is often called the Kalashnikov. It is also the favorite opening of grandmaster Evgeny Sveshnikov, who suggests naming it the Labourdonnais Variation, in honor of the great French player, who employed this scheme early XIX century. The Cuban grandmaster was not ready for the most principled lines, and opted for a solid continuation: White sacrifices a pawn for strong queenside pressure. Nakamura was unable to avoid the move repetition, and a draw was signed already on the 23rd move. At the press-conference Peter Svidler said that during preparation he noticed the 2nd round game Giri-Karjakin and realized that White can get a Gruenfeld-like position there. The Gruenfeld Defense is a favorite opening weapon of Svidler. “I was not disturbed by the fact that I would effectively have to play an extra game as Black – yesterday I won a game as Black, so Black is good color!”, concluded Peter with a smile. Both players admitted they studied this variation at home, but the idea of 12.Nd2 instead of the more natural 12.Nc3 was unexpected for Karjakin. White offered a pawn sacrifice, but Black did not hold onto material and transposed to an endgame with the passed pawn on d2, which was an asset and a weakness at the same time. Perhaps a full-scale study would allow Peter to create greater problems for Black. In the actual game Karjakin successfully rearranged his pieces, and the game was drawn. After the press-conference Sergey Karjakin and his wife received flowers and gifts from the press-center, as they celebrated the first year of their marriage. The opening choice of Fabiano Caruana – the Ragozin Defense – was a surprise for Maxim Vachier-Lagrave. After some thought he decided to respond with 8.Rc1, which passed the popularity peak several years ago, and it turned out that the Italian was not well prepared in this line. “I wanted to play something new today, but could not upload all the variations into my memory and suffered some problems in the opening”, said Caruana. After brief preparation White strengthened his knight on e5 and started the kingside assault. Black’s position looked dangerous, but on the move 21 Vachier-Lagrave chose a wrong path: he sent his queen to b3, intending to prevent Black’s only counterplay idea Qa5-b6. However, the simple 21…b5! stressed that White is unable to prevent …Qb6 anyway, and the queen is completely misplaced on b3. Perhaps White had to acknowledge his mistake and return the queen to the kingside despite losing a couple of tempi. Instead the French grandmaster initiated active play on b- and c-file. He won a pawn, but Black opened the long diagonal for his light-squared bishop and created serious threats to the king. Caruana attacked energetically, and soon White resigned, unable to save one of his pieces. The Bogolyubov Defense led to a symmetrical game with White having a good light-squared bishop against Black’s bad one. “White had many promising options with big winning chances, but I failed to find the best way, constantly worrying about not selling my advantage too cheaply”, said Tomashevsky. For example, Jakovenko pointed out that 21.Bf1 instead of 21.е3 looked very strong: White protects the е2-pawn and prevents 21…Rb8 at the same time, because after 22.Rb1 Black has no back rank checks. Black played the entire game on the ropes, however, in the end of the day he managed to defend and save half a point. 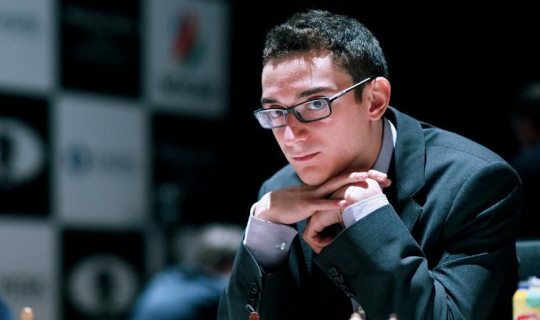 After four rounds Fabiano Caruana is in the lead with 3 points. 2-3. Dominguez and Svidler – both 2.5, 4-8. Gelfand, Grischuk, Karjakin, Nakamura, and Tomashevsky – all 2, 9-12. Vachier-Lagrave, Giri, Jobava, and Jakovenko – all 1.5. Monday, May 18 is a rest day.